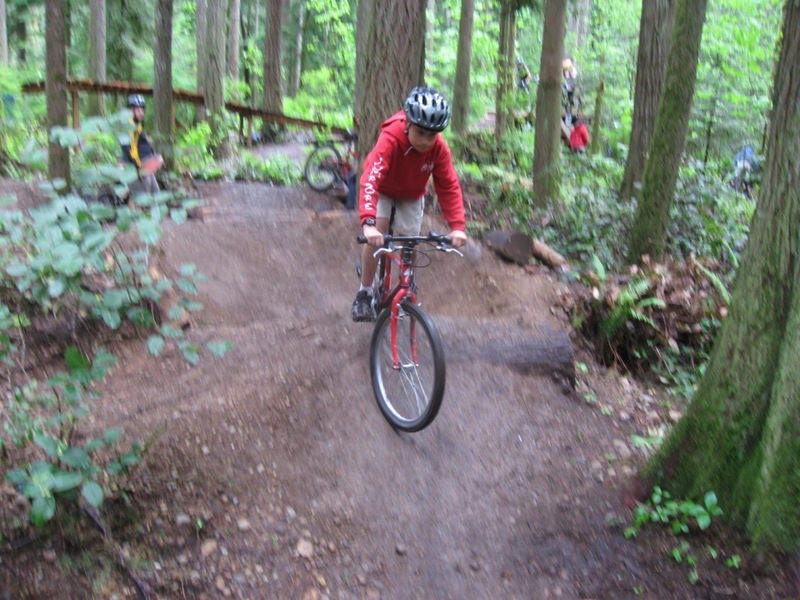 This blog about the grand opening of Duthie Hill Mountain Bike Skills Park has been posted on Mountain Bike Magazine’s MB Word blog, so you can read it there. 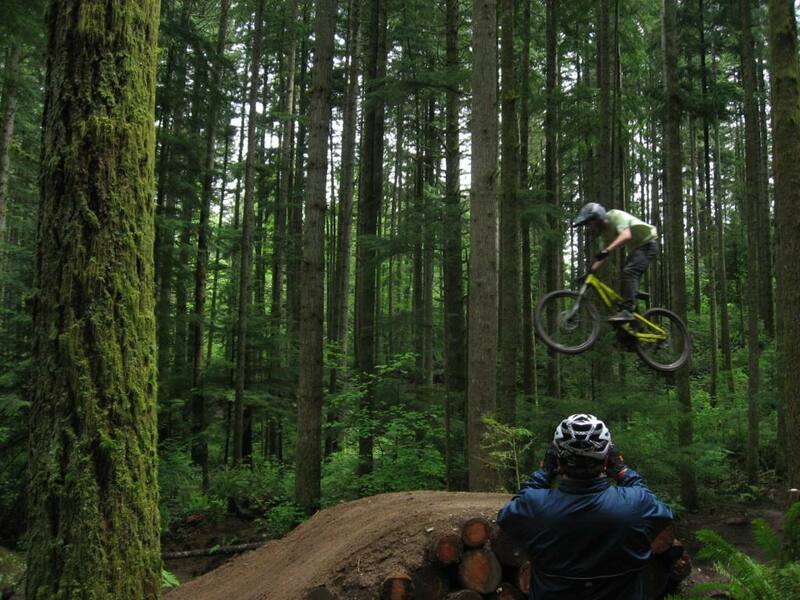 A rider throws down on the Paramount line. 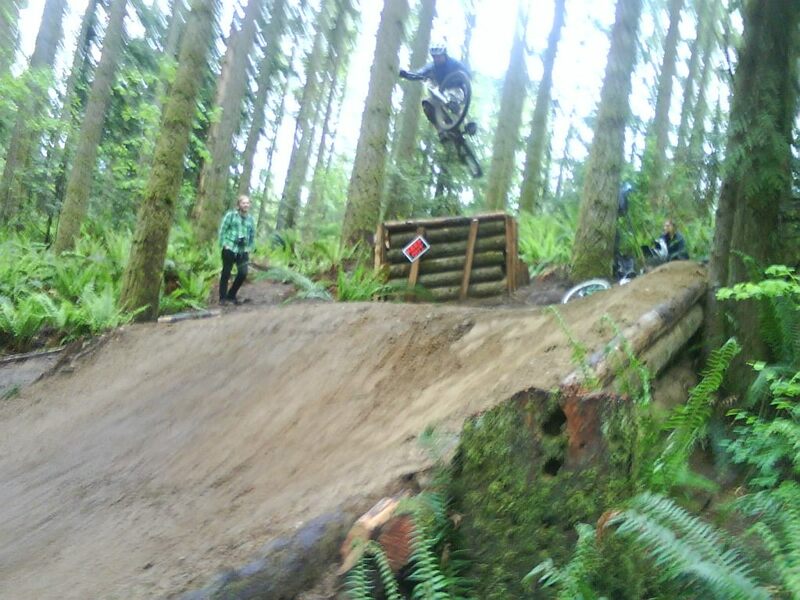 Young track racer Trenton Aiello from Mill Creek, Wash., tests out his mountain bike on the pump track. 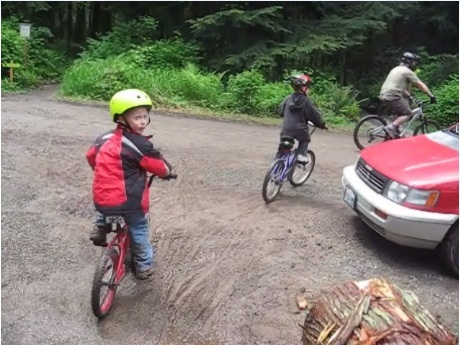 Five-year-old Kale Shelton (with his father and his twin brother Liam) from Renton, Wash., exits the Bootcamp trail with style. 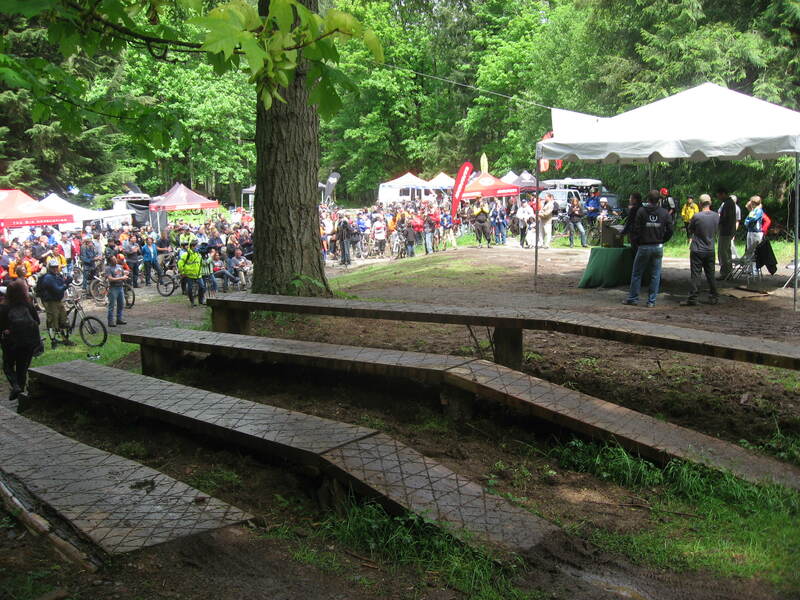 Check out the crowds and vendors behind the progressive drops area. At noon, King County Executive Dow Constantine and EMBA officials performed the ribbon cutting ceremony. One speaker singing the praises of the bike community was Duthie project manager Mike Westra, renowned for his work overseeing the work on the I-5 Colonnade. 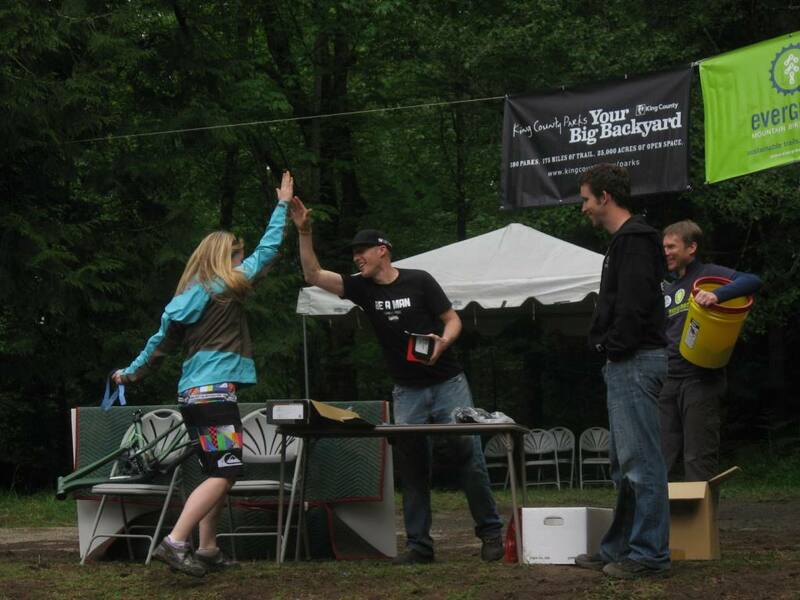 Jon Kennedy, marketing director for Diamondback and former EMBA Executive Director, led the raffle, handing out high-fives and product donated from sponsoring companies. … and this is just the beginning. There’s way more to come. 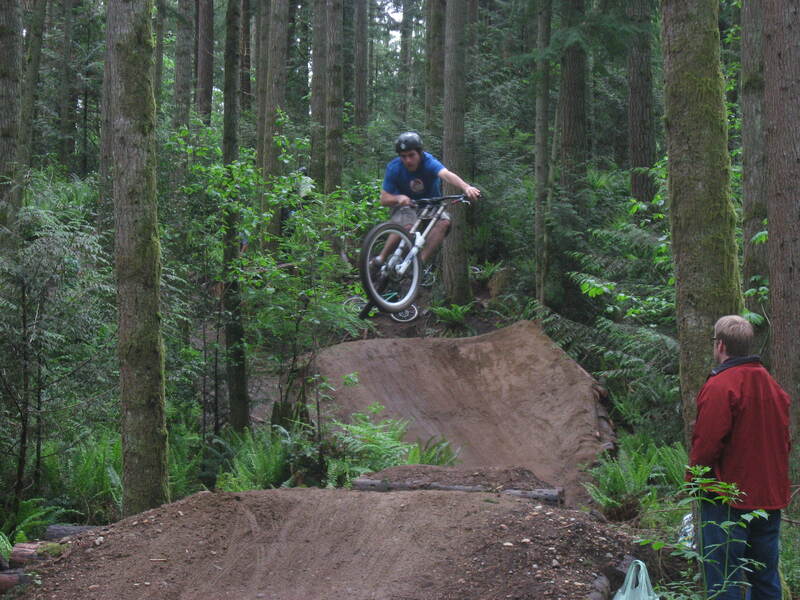 This entry was posted in Biking, Issaquah trails, Washington (Western) and tagged duthie hill, Evergreen Mountain Bike Alliance, grand opening, Issaquah, mountain biking. Bookmark the permalink. Hey Angela, I’m sure you meant to publish IMBA (International Mountain Biking Association), not ‘EMBA’. Nice photo coverage. Looking forward to getting up there in the next couple of weeks to check out the scene. 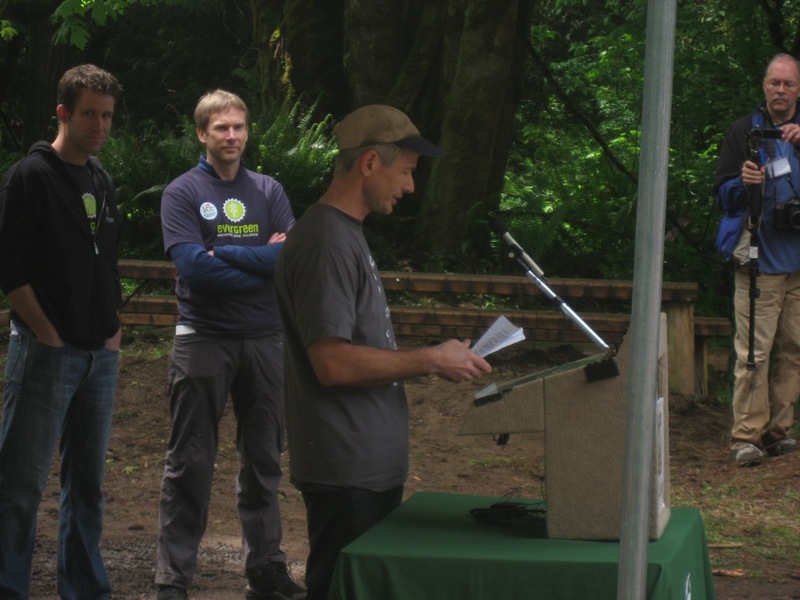 Would also be great to shed some recognition on our trail building volunteers; without them, and the advocacy efforts of the local IMBA chapter, parks like Duthie wouldn’t be possible. For all those folks who ride, a $25 IMBA membership and a few volunteer hours on the trail will help keep this park, and more like it, well maintained and open for business. 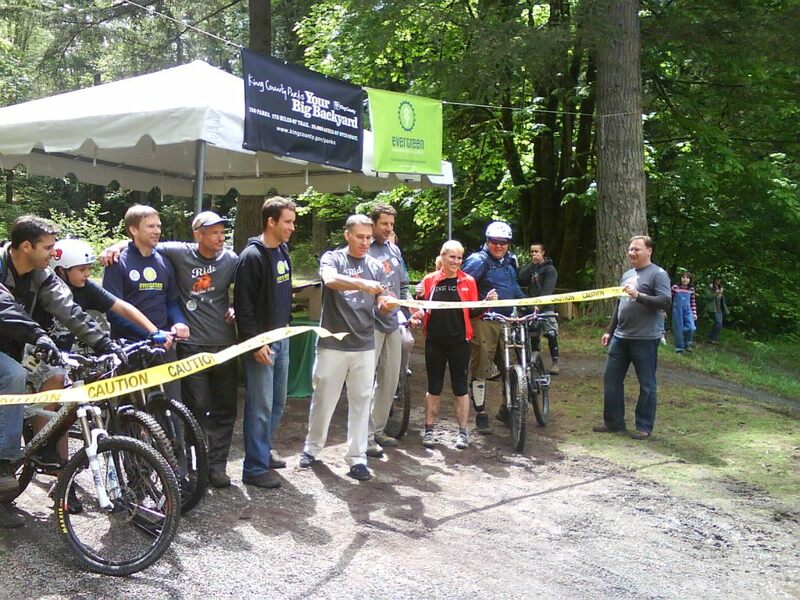 Congrats to all those involved in the Duthie effort… it’s been a long time in the making and serves as a great example for more mountain bike access areas to come in the Northwest region. Thanks for your comment. But no, it’s not IMBA I meant. 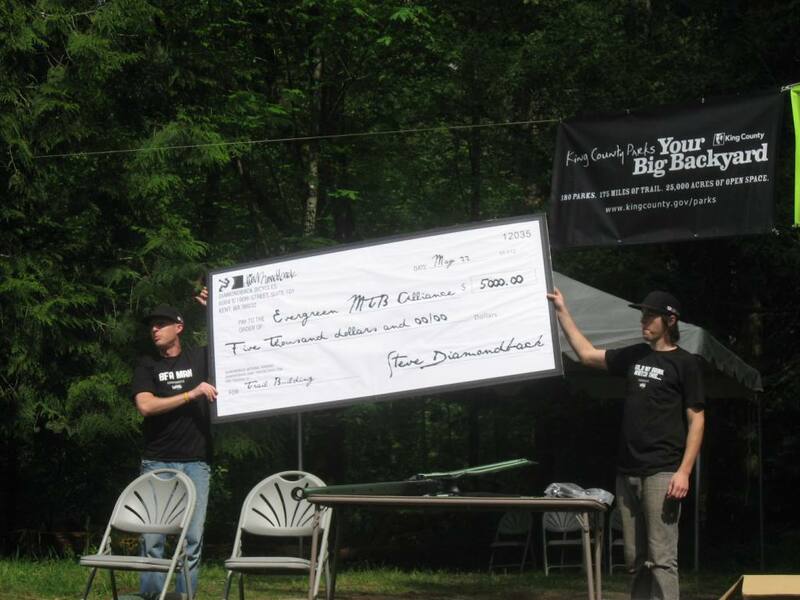 If you reread the article posted on MB Word you’ll see that Evergreen Mountain Bike Alliance (not IMBA) is referenced. However, as it turns out, the organization (which has gone by “EMBA” and “Evergreen” on different occasions in the past) is as we speak rebranding itself to avoid the kind of confusion with IMBA that you experienced. From now on they’re “Evergreen” all the way. My bad! Just caught the second article and really appreciated the partnership recognition. Shoulda read that one first! Thanks again for highlighting this park!